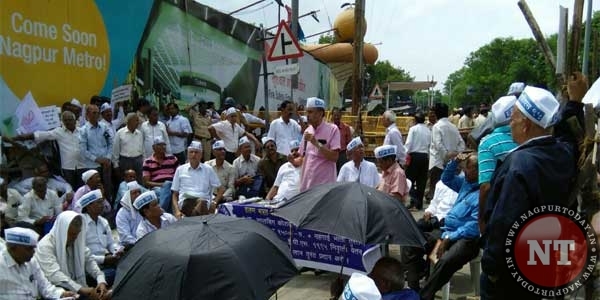 NAGPUR: The monsoon session of the State Assembly is witnessing a large number of demonstrations in Nagpur. Every year, large number of agitating people and organizations assemble in Nagpur to stage demonstrations to press for their long-pending demands. Every time people come with the hope that the government would show some sensitivity towards their problems, but every time they return disappointed and empty-handed as their demands fall on the deaf ears of arrogant politicians. Like many years, the members of Retired Employees’ (1995) Coordination Committee staged a demonstration near Samvidhan Square demanding pension benefits. The hundreds of retired employees were led by the organization’s president Prakash Ende and secretary Prakash Pathak. Prakash Pathak informed that they had been demanding implementation of Koshiyari Committee recommendations since last many years, however the governments always neglected their demand. He also demanded dearness allowance to the retired employees. The agitators demanded from the Chief Minister to ask for their pension benefits from the Central government.